Caribbean Lifestyle Media-GT Taylor is gearing up for his annual Christmas Reggae Extravaganza in St. Elizabeth, Jamaica. This year GT Taylor has a few surprises on the bill-Italian Reggae star Brusco is said to be one of the hottest Reggae stars in Europe. Brusco is a disc jockey on the Italian sound system Gramigna. 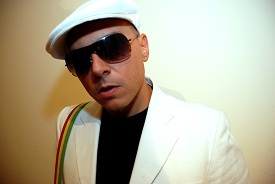 In June 2010 the artiste published for Macro Beats Records his first international CD Take Off Vol . The Volume includes songs such as Just Another Day (with a custom version for Irie FM), Smoke a lot, Nuh Care featuring I-Octane, Land pon Me, She wants me featuring Konshens. The event is set to take place at Independence Park in Black River, St. Elizabeth. GT Taylor said, “A lot of tourists visit St Elizabeth at this time of year and it is important that the show has an international flavour. Brusco is bringing a unique combination of Reggae and Italian sounds, something I believe both locals and visitors will absolutely enjoy”. The event is sponsored by Jagra and Showtime starts at 8 pm at Independence Park Black River on Saturday December 25.